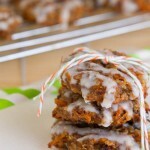 Vegan, gluten-free carrot cake cookies made with cooked quinoa, maple syrup and raisins. 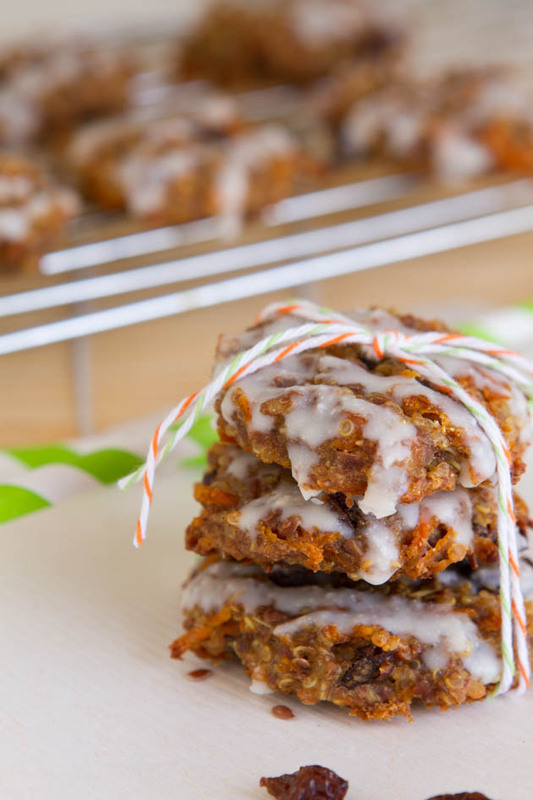 All the goodness of carrot cake, with a breakfast feel. 2 tablespoons grape seed oil, or melted coconut oil, or walnut oil, or… any kind of oil you want, really! Add quinoa and water to a saucepan. Cover and bring to a boil. Reduce heat to low, and simmer for 15 minutes. Once complete, remove from the stove, remove lid and allow to cool for a couple of minutes. Meanwhile, preheat oven to 350F and line a baking sheet with parchment paper or a silicon baking mat. Set aside. Add all dry ingredients to a large bowl. Then, measure 1½ cups of the cooked quinoa and add to the dry ingredients. Stir to coat, until all quinoa granules are covered in the mixture. Set aside. Pour into bowl with dry ingredients and stir to combine. Stir in raisins and shredded carrots. One tablespoon at a time, scoop mixture onto prepared baking sheet, leaving a small space between each cookie. They will not spread out, so you can keep the cookies close. Lightly form each cookie, as you’d like them to come out. I flattened them slightly between my palms. Bake in preheated oven for 25-30 minutes, until cooked through and golden. Remove from the oven, let cool on the pan for 10 minutes before transferring to a cooling rack and allowing them to cool for a couple of hours. Because cooked quinoa was used in this recipe, the longer you leave it to cool, the firmer it will become. Leave it be and it will transform! Drizzle with melted coconut butter and serve. These cookies can be stored in the fridge for up to 2 weeks.